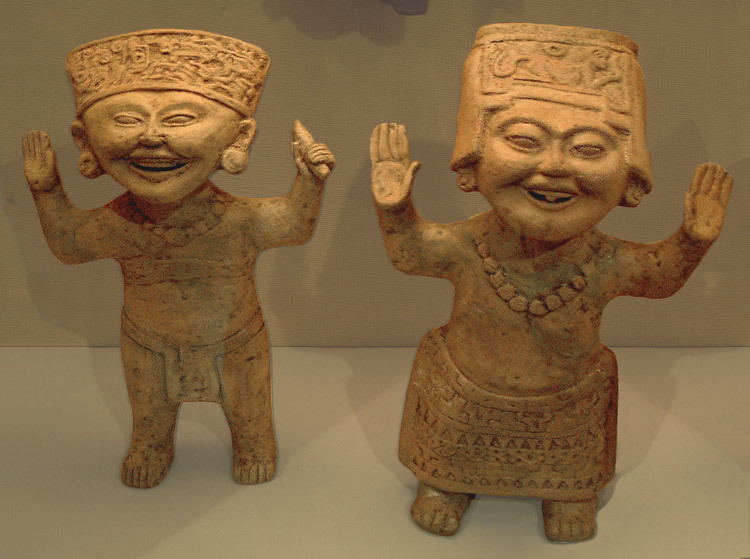 The Caritas Sonrientes, meaning “Smiling Faces” or “Smiley Faces”, are a style of artwork that portrays smiling human characters who wave their arms as if in celebration or performing a dance. 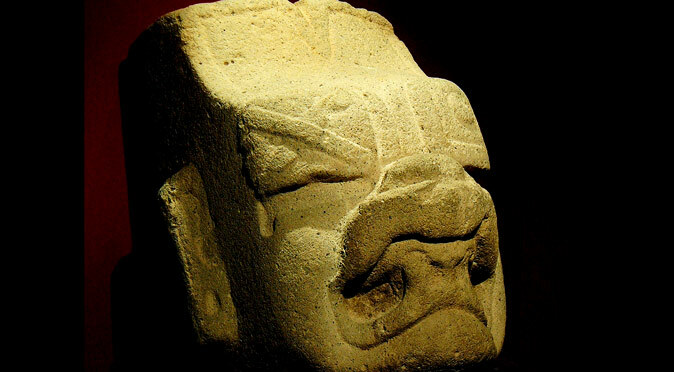 The Remojadas Culture of the Veracruz area of modern Mexico is largely accredited with their mass production which is believed to span a millennium from 100BC to 900AD. Happy emotions are seldom depicted in Mesoamerican art – in fact, it seems to be limited to this style of caricature, which is why their artistic style is named purely on their facial expression. The two examples found at the Museo Regional de Antropología Carlos Pellicer Cámara (fig. W0351) are perfect examples of the Caritas Sonrientes style, with the beaming smile revealing filed their teeth, the headdresses covered in symbolism, the bulbous necklaces, the male figurine wearing a loin cloth and the female wearing a decorated skirt and poking her tongue out. 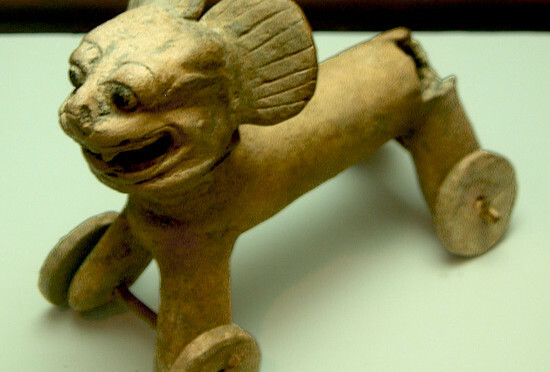 Because such smiling happiness is so unusual in Mesoamrican art, it is most probable that the happiness is integral to their purpose or meaning. Their production spans a huge length of time, but the artistic imagery barely changes, which tells us that they are not symbolic of individuals and must be religious characters. Some doubled up as musical instruments, such as ocarinas, whistles1 and flutes, which suggests they were played during celebrations and used to inspire the happiness and dancing that their likeness emulates. This ties in with one of the few explanations for their appearance. The swollen cheeks and poking-out tongue are thought to be symbolic of an over indulgence in an intoxicating drink known as pulque. Pulque is made by fermenting the maguey plant and was used in religious rituals to create a trance-like state. The smiley faces characters could then be representative of those intoxicated on pulque whilst doubling up as musical instruments that were used in the ceremony. 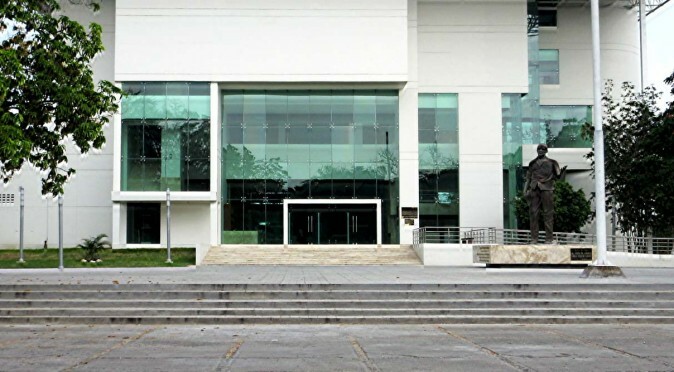 The only thing untypical of the two examples from the Museum of Anthropology in Villahermosa is that the heads are still adjoined to the body – because most examples appear to have been deliberately decapitated and then broken1, 2. This has led many to believe that they form part of a funerary or sacrificial ritual and that the smiley face was designed to provide the departed with some well-humoured in company the afterlife. However, if they were used during a celebration where pulque was consumed in large quantities, then this alone would probably account for how so many became broken! Whilst the true purpose of these characters is mystery, the key to deciphering them undoubtedly lies within their attire rather than their facial expressions. In particular, there is a lot of symbolism contained within the headdresses and because the symbols vary between statuettes, it means that this part almost certainly provides either a tribal or religious identity.